WordPress 3.0 is OUT NOW ! My most favorite blogging platform, soon to be used as a CMS, WordPress today released their 3.0 Thelonius edition. Ok, I just spent the better part of ALL DAY trying to figure this out. I want my wordpress category.php template to be able to detect whether the category it is serving is a parent category or subcategory. THATS IT. And without having to hard code any category ID’s. After perusing the forums and codex for a couple of hours, the marriage of these two functions seemed to get the job done. get_query_var is the variable stored in the query that tells category.php what category to serve. Hope this helps some people out there. WordCamp NYC 2009. Be there, or be square. 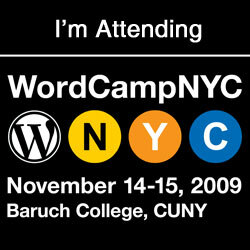 I’m very excited to say that I will be attending WordCamp NYC 2009. I have been working with WordPress for the past two years and it has completely revoltuionized the way I design web sites. If it weren’t for WordPress, I wouldn’t lead the life I live today. But that aside, its exciting to participate in such an awesome community. I look forward to meeting fellow WordPress users and abusers. So as some of you may have noticed, Google made their search bar more accessible to the geriatric community by enlarging the search bar and font size. Now as a human being (aka ‘creature of habit’), this bothers the hell out of me. I’m totally not used to it, I don’t want to get used to it. Just put it back to normal. Now I’ll be the first to admit, I have a problem with Firefox plugins, in that I use entirely too many. But this one is totally worth it. With user scripts that return the Google search bar back to normal, pimp out your google reader, AND google calendar, you can’t go wrong. So today I’m writing to you from my Blackberry! How to Display an Author List with Avatars in WordPress. So the company I work for have been having issues with wordpress’s visual editor and copy and pasting linked images.